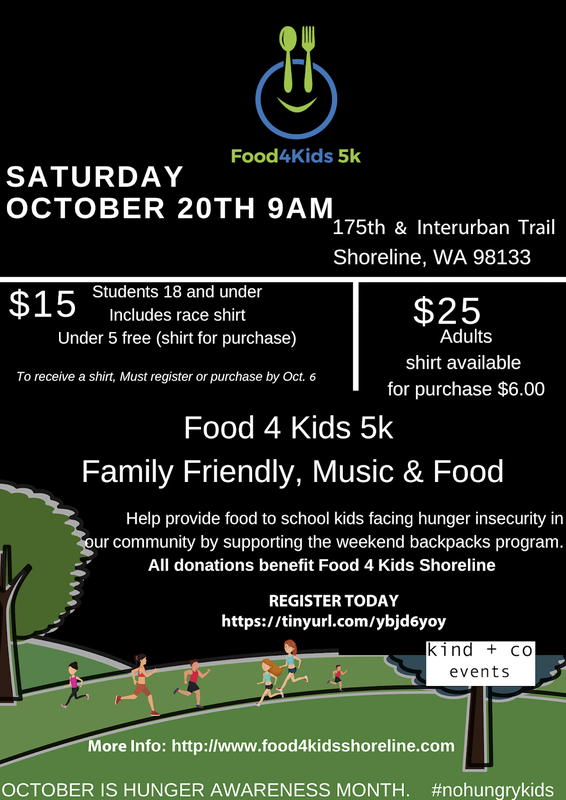 Food 4 Kids is organizing a family friendly 5K on Saturday October 20, 2018. They are raising money and awareness for kids in the Shoreline Schools that go hungry on the weekends. All proceeds will be donated to the Friday FoodPack Program. Join us on Saturday, October 20th for the first annual Food 4 Kids Fun Run/Walk benefiting Weekend Backpack Program. The weekend Backpack Program provides supplemental food during the school year to students in the Shoreline School District. The goal is to raise over $5,000 for the weekend backpack program and help ensure that over 300 children receive adequate food on weekends. The 5k and 3k routes are set to proceed down the historical Interurban Trail through the Shoreline community. The net proceeds benefit the Food 4 Kids-Shoreline Program and is an outreach of Calvin Presbyterian, Shoreline Free Methodist Church, Aurora Nazarene, Berean Bible, City Calvary Chapel, First Lutheran, Shoreline Christian, Shoreline Community, Shoreline Seventh Day Adventist and Lake Forest Park Presbyterian Church.